“What could you possibly be texting about in my class? 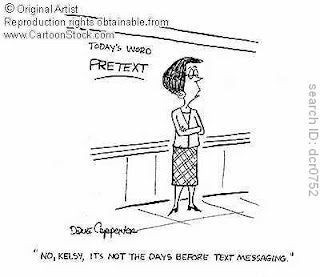 I ask the other students to think quickly...What could “Student A” be texting about that is so important? from students. Don't ever let your kids catch you on it or texting. It just sets a bad example and gives you no leverage when confronting them. 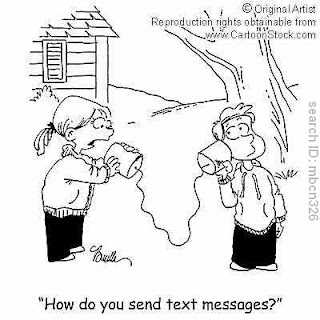 Finally, get your kids a text plan that has a cap, make them pay for it and don’t bail them out. I can guarantee you the phone companies are not reading this article with a troubled face. Today is my parents' Anniversary. They have given my brother and I so much support through out our lives and our academic careers. Every year I try and think of a gift I can give them that can sum it all up. Unfortunately Apple does not have an 'App' for that. So how do we repay the ones who have given us every piece of their lives, made endless sacrifices and have simply been there? How do we show them our gratitude? For me, it's simple. I always try and find something that will make my mom cry (in a good way!). With my mother that is never hard. And my Dad loves looking back at old photos, but hates posing for them. So this year I wanted to combine these ideas in a way that both visually and musically capture 32 years of marriage. George Lucas was busy, so I turned to my good friend Animoto! Yes, I am making another plug for this grand application! I hope since reading my last post on Animoto you have tried it many times over and even come up with an assignment for your class. I cannot stress enough the brilliance of this application and hope that you give it a try. Even if you don't use it in your classroom, take a few moments to use it to say, "thank you" to those who have "been there" in so many ways. A colleague of mine recently informed me of her troubles with incorporating the idea of a social network into her classroom. The primary concern is the safety and privacy of her students. This cause for concern is completely warranted and should be addressed anytime you allow students to engage in a web based social network forum. However, my concern with the social networking scare is that our children and students are privy to a social network everyday of their lives. It is called school. The 21st century student is connected in myriad of ways. Most have a cell phone, iPod and a digital camera. Some simply have an iPhone. These devices allow students to connect, share and collaborate with anyone. Furthermore, students have more accessibility to each other outside of their social networks. The social network, whether it is facebook or myspace is exactly what, those of us who grew up in a pre-online social network world, did everyday! We took pictures of our friends. We hung them in our rooms or dorms. We relayed secretive notes to those who made our heart flutter through back channels. We snuck out late at night to visit our significant other while our parents were fast asleep, just to steal a kiss down at the end of the block. We sent letters to each other in college and would call from our telephone. Instead of texting in class, we would doodle or write notes about plans for the weekend. Instead of “sexting” we would just write dirty notes to our girlfriends or boyfriends. We had hundreds of friends at our disposal everyday at school and every Friday night at dances when the neighboring schools would join. Links to websites that feature our friends, interests or favorite teams. Digital clip art that represent our causes and political affiliations. A. About as frequent as hearing about a plane crash. B. Dramatized and sensationalized for ratings. C. A Situation that is unmonitored and unstoppable in any social forum. So what is the big scare with social networks? We are all a part of them everyday and have been without knowing for years. Today’s student simply has the abridged version of what we had all but 15 years ago. Let’s be honest, today’s student is lazier then we have ever been. Yes, they are precious and we are all, “so proud of them”, but lets face it, they have it pretty good (well that’s if you exclude graduating into the worst economy in history). 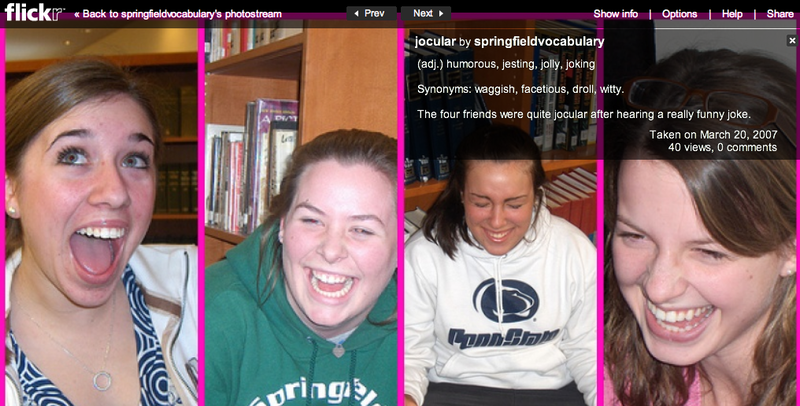 There are many great upsides to allowing students to be part of social networks. One of them is the website called Zinch. Zinch is a social networking site used by many major colleges and universities across the nation. Like facebook, Zinch allows pre-college students to set up a profile that lists all of their major academic achievements. Universities and colleges actually look at this information and in some cases, students can even apply for scholarships directly through this site. It is a great way for students to access heaps of information and showcase themselves in a positive manner. 2. 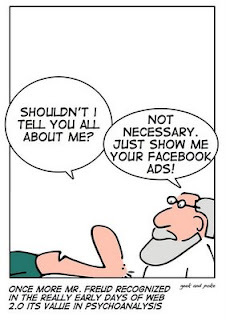 There needs to be complete transparency with any virtual social network. Like reality, all content should be on the surface for all to see. 4. There should be a district wide “Social Networking Constitution” that every parents, faculty member and student should have to sign. A team of all of the above including administration should create this document. There, fairly simple. With great power comes great responsibility. Venturing off into a social network with your students should be taken very seriously, however, you should not be afraid. If you plan it out and cover your bases it should be a wonderful, collaborative environment. I hope all who read this understand that social networks are nothing new. They have been part of our lives for years. The functionality is all the same, however, the medium* has changed greatly. 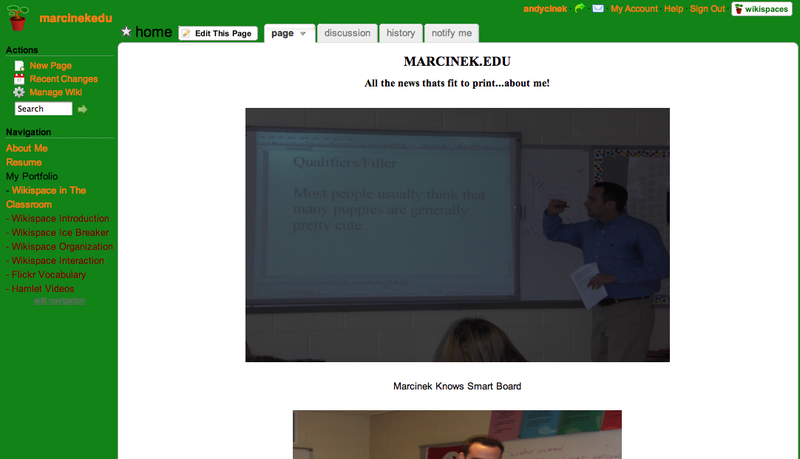 Please leave me feedback on the parameters your school district has set for using social networks. And let’s collaborate on the best practices for implementing social forums into the classroom. Thank you so much for your kind email and for featuring Threadless on your blog! This is an awesome article! Since you talk about bringing Threadless into the classroom in your blog, I wanted to let you know that we have taken the idea to inspire students one step further and have launched a program called Threadless 101, where the regular Threadless design challenge is scaled down for teachers to use in the classroom! I think you'll enjoy reading about it and hopefully blogging about it even more. Please feel free to read up on it in the attached introductory letter and check it out here: http://www.threadless.com/artists. Please feel free to email me anytime with questions! Users log in, and submit an original design that they created. The design is then put into a forum for users to critique and praise the design. If the design receives enough recognition, threadless will put it on a t-shirt and feature it in their store for sale. I liken this site to a student-writing contest. The author submits an original idea and gets recognized for it and in some case, will receive a monetary gift. Plus, imagine applying to art school with a best selling t-shirt in your portfolio! That will surely get the attention of admissions officers! I think every art classroom should make a strong push to have each student design a t-shirt for threadless. Even if the students’ design is not selected they are interacting with their peers and getting the opportunity to see and learn from other designs. Just by replying on a threadless forum, students are networking with other artists. This forum can create opportunities and lead to possible internships or job experiences. I’ve never taught art, but if I were to incorporate threadless design into my art class, here is what I may cover. Students create their design and present it to the class. They have to address their process and inspirations for creating the design as well as field questions and criticisms from their peers. Once they have been through the class presentation gauntlet they will submit their design to threadless.com and report back on the responses they receive. This is a fun project any art classroom should welcome. It incorporates technology, creativity and social networking. Plus it gives the student portfolio a little extra flare! I hope you give threadless.com a try and I look forward to hearing how you have used or plan on using this site in your classroom! 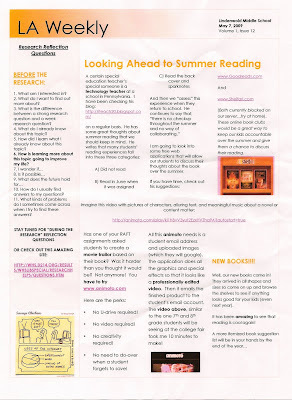 In their weekly news letter, the Language Arts Department at Lindenwold Middle School, in Lindenwold, NJ featured two blog posts from iTeach. The newsletter focuses on utilizing Shelfari and Goodreads for their summer reading program. The newsletter author asks teachers to check out these new learning tools and finds both sites to be a good way to keep students accountable over the summer. The author also covers the Animoto post and encourages teachers who are hesitant about making videos in the classroom, to try this new tool and experience the ease of the application. Thanks to all who share and collaborate new teaching ideas! Today I am reviewing a great website that I found via a friend on twitter. The site is called Visual Thesaurus and is designed by Think Map. The site is a visual Thesaurus and Dictionary that breaks down words by using a web mapping platform along with categorical organization. What I did today was create three videos that show you how to use the Visual Thesaurus application, The Vocab Grabber Application and the Spelling Bee application. 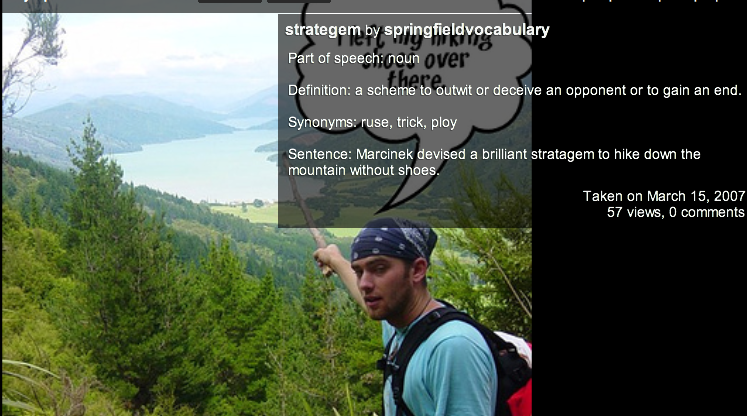 Each tool will help students see vocabulary and reading comprehension in a different light. The words jump from the pages and dance around on the computer screen in an organized fashion. I am very impressed with this site and their applications. I think every school district should put this software into their budget for the 2009-2010 school year and beyond. I know I will be using it in my classroom, will you? As always, I welcome your feedback and experiences using these applications! Today's post is not so much of a lesson, but what will become the future of reading. I'm referring to the Kindle from Amazon. Yesterday I read this article that chronicled the launch of Amazon's Kindle DX. This new gadget immediately alerted my attention and got me thinking really fast about the future of reading and its effect on the classroom. In its inception, I thought the Kindle would go the way of many other tech fads that try and replace a staple that has been a part of our lives and classrooms for years. Yes, the text book will be replaced someday! And when we are all wearing our conforming tin foil-ish jump suits and fulfilling all of the visions of Doc Brown in Back To The Future II, will we reflect on the good old days of the text book? It's an interesting question that I have trouble answering. In a world were everything is getting smaller and more connected, books and newspapers have continued to be a part of our daily lives. However, with the recent economy down turn and the continuing rise of free news on the web, the old standbys are slowly, but surely being replaced. My bold prediction; The Kindle DX will replace all forms of books and newspapers. When this happens, our classrooms will change as well. Let's be honest, did we ever think the book or newspaper would be replaced? I did, but I know my father did not. So let us imagine a not so distant classroom and provide some scenarios that I can foresee via my Prophet App on my iPhone (NOTE: There is no prophet App, but give it time!). At the beginning of the year your students come into class with your syllabus uploaded to their Kindle. They can view this anytime their Kindle is around because the newest incarnation of the Kindle has a PDF reader. Your students sit down and you ask them about current events that they read this morning on their Kindle via their downloadable Newspaper subscription. They have access to the New York Times, Washington Post and the Boston Globe. Your students are preforming research and have access to text books and journal articles that they can read on demand via the Kindle. For homework your students are given their class book list and they must download all of their titles for the semester. Yes! No book numbers, no torn out pages, no graffiti, etc! A thing of beauty! And the best part is, once the book is downloaded on to the Student's Kindle, they can have that book stored for years! We are building libraries in our students hands! As long as students don't lose their Kindle, they have access to thousands of books and documents. School Districts with a book bag policy will gladly welcome the lack of heavy text books when students can simply carry their Kindle to class and also avoid early back problems and scoliosis . This is a lofty goal for me to imagine and there are plenty of downsides to this brave new book. The Kindle DX has a price tag of $489.99, however, I am sure the good folks at Amazon would welcome a school district discount. And what happens when our students lose this valuable piece of equipment? When you have a book, you replace it at minimal cost; a Kindle, not so much. According to the article above five Universities will be piloting the Kindle DX next fall. It will be interesting to hear the results of this pilot program and discover new ways to incorporate this gadget into classrooms around the country. However, with any new technology we must take baby steps and see the pros and cons of it. I am not saying that the Kindle will end books in classrooms, but it stands a good chance of being in all of our curriculum sooner than later. As we storm forward in the 21st century we must be open to these new technologies and welcome them with patient arms. Things are changing faster than ever, and we need to proceed with a vision when incorporating new technologies into our lives. Especially when they are replacing trustworthy companions that have been with us for so many good years. As the school year dwindles down towards summer days and departmental planning for next year, why don't you take an educated risk and start a Ning in your school or department for next school year! A Ning! A Ning is a social networking platform that allows users to create their own network! 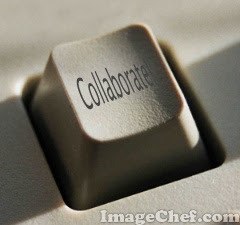 It is very easy to setup and use, plus the collaboration aspect is excellent! Creating a ning allows users to share information, such as links, personal blogs and even create discussion forums. You can make your Ning private or open it up to the entire world. Users can send messages, write on your personal page and share, share...share! Plus it would flatten the walls of your department and allow you to collaborate easily in the summer and over vacations. If you are still confused and still trying to figure out just exatcly what social networking can do for your school or department, I will leave you with a brief video courtesy of Mr. LeFever. Enjoy and I look forward to hearing about all great departmental Ning's you have created!